Turmeric is an ingredient I’ve been using a fair amount lately, and I realized it’s been a while since I’ve talked about it here. One of my most popular posts in the past couple of years is for a Turmeric Shot, so it seemed like maybe you were jumping on the turmeric craze too. Once I made this Tropical Turmeric Chia Smoothie, I knew it was time to talk turmeric again. One thing to keep in mind when working with this spice is that it will stain if you don’t clean your cooking utensils and equipment quickly. I prefer to use glass for anything it’ll be in for a while. Before we get to the Tropical Turmeric Chia Smoothie, let’s catch up on turmeric for a moment. It’s great to cook with, add to drinks, even create some DIY products for your skin. But not only that, it has TONS of great benefits for you. Natural Anti-Inflammatory: Turmeric contains curcumin, which is a super powerful anti-inflammatory substance. Antioxidant Power: The curcumin in turmeric offers two ways to kick free radicals to the curb. First, curcumin blocks free radicals on its own, then it stimulates the antioxidant mechanisms in the body itself. Pretty cool! Increases Brain Function: This fact makes me want to start eating a lot more turmeric! It is capable of increasing levels of BDNF (Brain-Derived Neurotrophic Factor), which when these levels decrease can be linked to depression and Alzheimer’s. 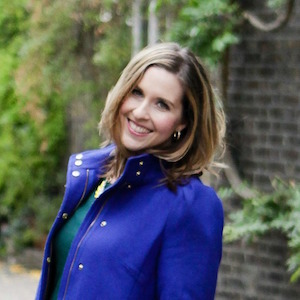 Plus it could help improve your memory…where do I sign up?! Lower The Risk of Heart Disease: Heart disease is a serious issue for a lot of the world, and curcumin (found in turmeric) can reverse several steps in the heart disease process. Score! Prevents (And Maybe Even Treats) Cancer! : Okay I don’t hate much, but I HATE cancer. It has stolen some of my favorite people from the world, so I am all for finding ways to avoid cancer. I am not going to go into all the technical details, but curcumin can actually reduce the growth of tumors and spread of cancer and can even contribute to killing cancerous cells. 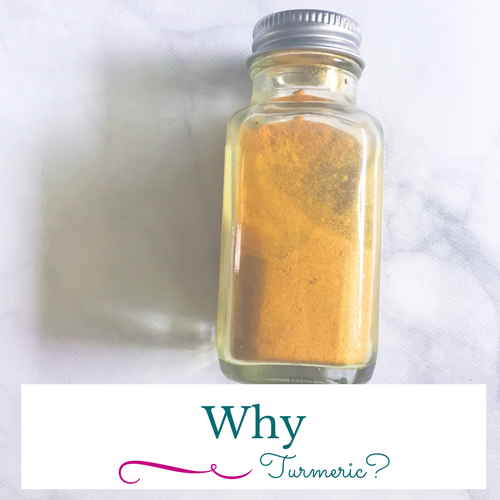 Can you believe there are even more benefits of turmeric than what I listed above? To get a full list, and see more info on the above benefits and my source, click this link. While I love cooking with turmeric, I really have enjoyed it in drinks. Being able to drink turmeric is a fast way to get the benefits of this fabulous spice. So we have the Turmeric shot, which has some tang but is effective. There are also ways to drink it in warm almond milk, which has been great. 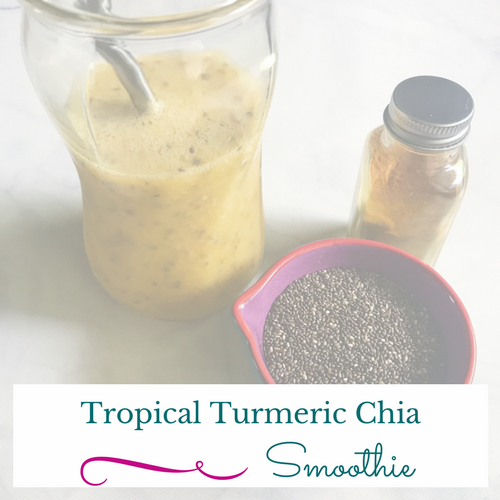 However right now the temperatures are heating up, so I was ready for more of a turmeric smoothie, which is where this Tropical Turmeric Chia Smoothie came in. Two things I learned from this month’s Cookbook Love feature are that papaya and turmeric are great for your skin. Papaya provides a great source of Vitamins A & C plus potassium, folate, and fiber. Turmeric is anti-inflammatory and both ingredients are great for helping with digestion. They seemed like a natural combo for a drink, and I love mango in smoothies for a tropical touch. 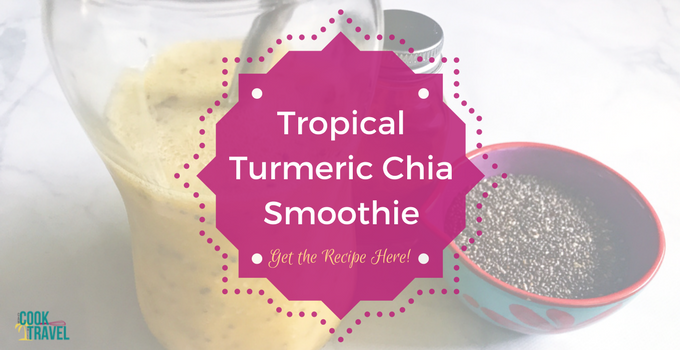 I can’t wait for you to try this refreshing Tropical Turmeric Chia Smoothie, and a bonus is you get the advantages of chia seeds. These seeds are packed with omega 3’s, along with fiber, iron, calcium, and antioxidants. This is one powerfully packed drink right here! This smoothie is packed with good for you ingredients like turmeric, chia seeds, and papaya! Add all ingredients EXCEPT chia seeds to your blender. Transfer to a glass and stir in the chia seeds. Let smoothie sit for a couple of minutes to allow the chia seeds to thicken the smoothie slightly. Then enjoy! 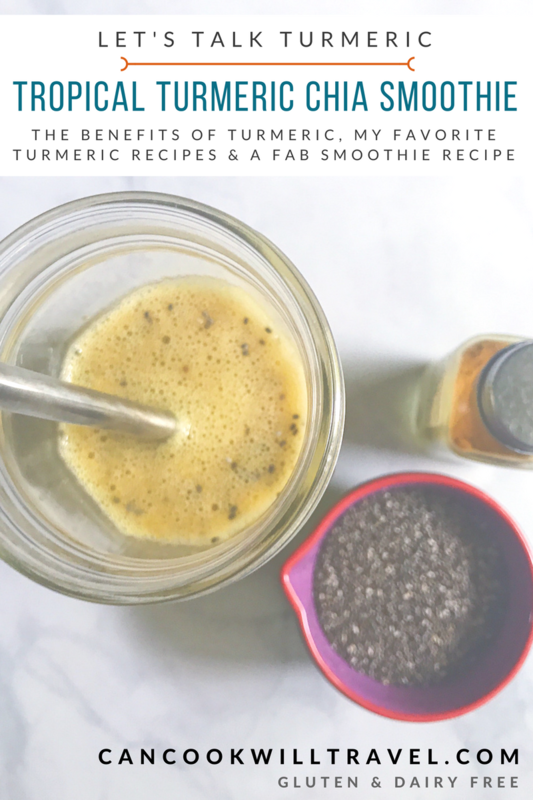 These days I tend to keep all of the above ingredients on hand, so this Tropical Turmeric Chia Smoothie is a cinch to whip up. And it is by far the most refreshing way to enjoy turmeric, in my opinion. Are you ready to find some great uses for turmeric now? I know I was, so here are some of my favorite uses for this awesome spice. Face Mask: I love an easy DIY product that’s all natural, and this face mask makes your skin feel great! Turmeric Shot: If you want a burst of energy in the morning, start it with this powerful shot! Turmeric Sweet Potato Bowl: I’m obsessed with this recipe, and it’s one you really must make for lunch very soon! Smokey Roasted Butternut Squash: This healthy side is the perfect way to enjoy butternut squash with a touch of turmeric to make it even better for you. 30 Minute Bang Bang Chicken: Whip up this chicken dish that’s not only delicious but, you guessed it, has turmeric in it! Blueberry Lemon Burst Cake: Yep, turmeric can even be in desserts with this delicious cake! I think we’ve covered a ton on the turmeric front today, don’t you?! From all the reasons you need to start incorporating more turmeric in your daily life to TONS of recipes, definitely pin this post for future reference. I know I will be! Have you used turmeric much? What’s your favorite way to incorporate this powerful spice? Comment below, because I’d love to know! 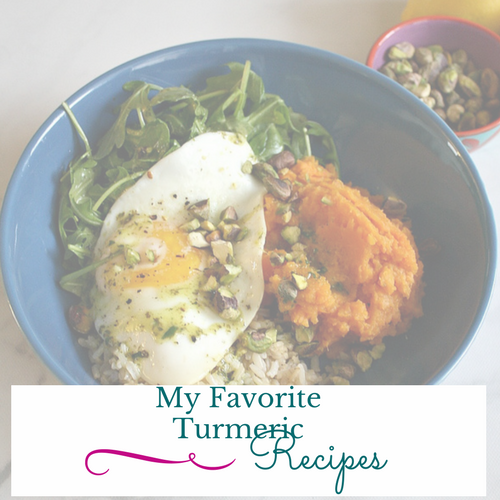 Stay inspired & eat more turmeric!